Does your future look like your past? Are you inadvertently sabotaging your goals, your dreams, and your future? 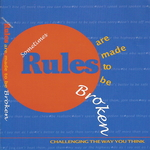 Are the rules that shaped you as a child suppressing you as an adult? In this powerful and energizing program challenges the way you think by helping you identify the rules that may be responsible for limiting your personal and professional growth. Dawn and Ross give you the tools to take control of your life and find your own happiness and success. My Way or the Highway; Do what you love, love what you do and fill your life with passion, purpose and meaning. Do As I Say, Not As I Do; Walk your talk and lead by example and you will create a lasting legacy of leadership. Better To Be Safe Than Sorry; Stretch the limits of your comfort zone by taking a leap of faith. Don’t Bite Off More Than You Can Chew; True balance only exists globally, so don’t be afraid to say yes when opportunity comes knocking. Stop Dreaming, You’ve Got To Be Realistic; To love big you have to dream big. To dream big you have to challenge reality. Don’t Speak Until Spoken To; Increase your confidence and self-esteem by facing old fears and don’t be afraid to speak up. Good Things Come To Those Who Wait; Take the initiative and go after what you really want out of life. If You Can’t Beat ‘Em, Join ‘Em; Take a stand and don’t give in when others are against you, and you will be victorious in all that you do.